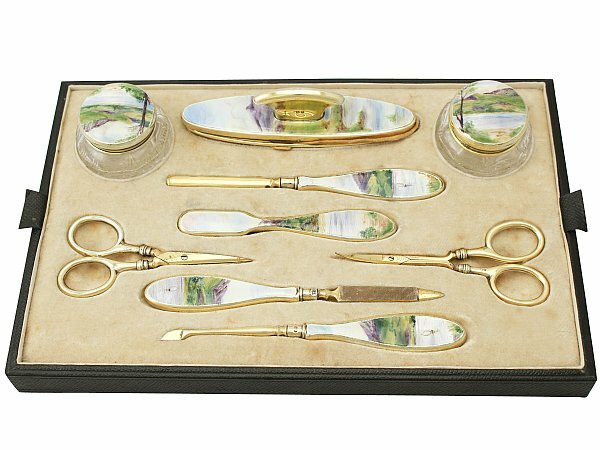 This impressive antique George V cut glass, sterling silver gilt and guilloche enamel dressing table set consists of two dressing table jars, a nail buffer, a nail brush, a pair of nail scissors, a pair of toenail scissors, a nail file, a cuticle pusher and a nail cleaner. 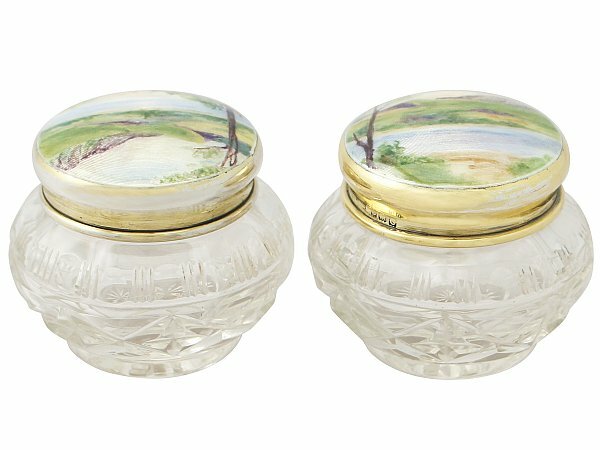 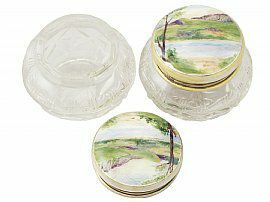 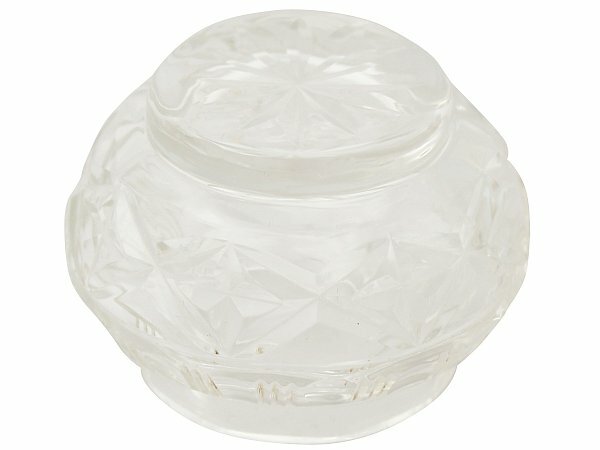 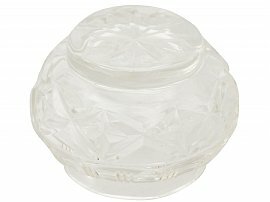 The two dressing table jars retain the original hallmarked compressed circular rounded cut glass bodies with push fit covers. 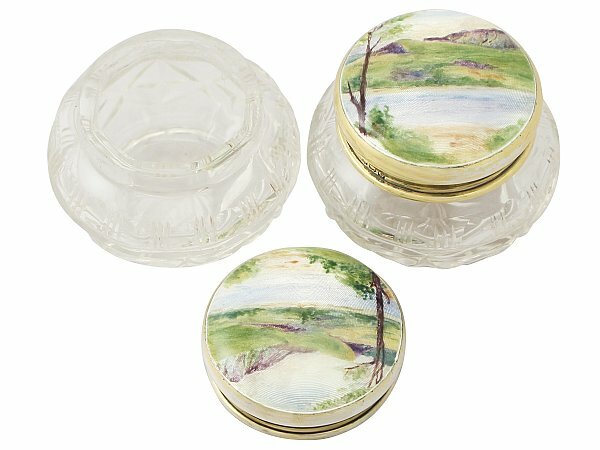 The covers are embellished with impressive hand painted hot enamel panels depicting a lakeside scene amidst foliate and mountain backdrop. 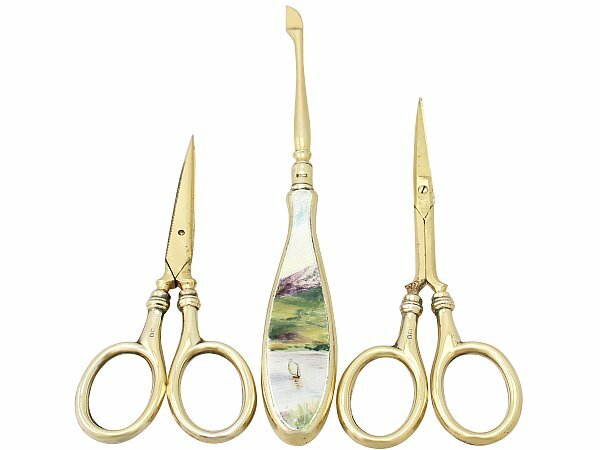 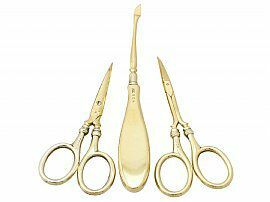 Both pairs of hallmarked scissors have a simple collar to the upper portion of each of the finger pieces. 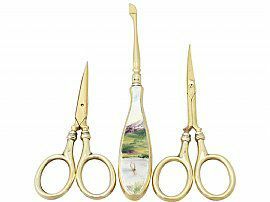 The toenail scissors have plain steel blades and the nail scissors subtly curved blades. 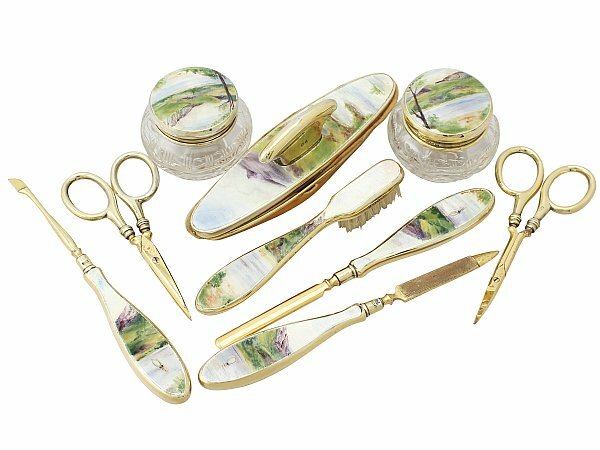 The rounded handles to the cuticle pusher, nail cleaner, nail file and nail brush and the upper portion of the nail buffer are ornamented with further panels of impressive enamel lakeside scenes. The undersides of each of these items is plain and unembellished. 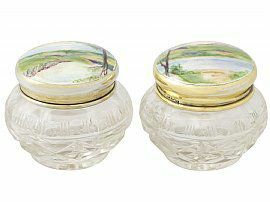 The sterling silver surfaces of each piece, including the blades and interior of the jar covers are gilded. 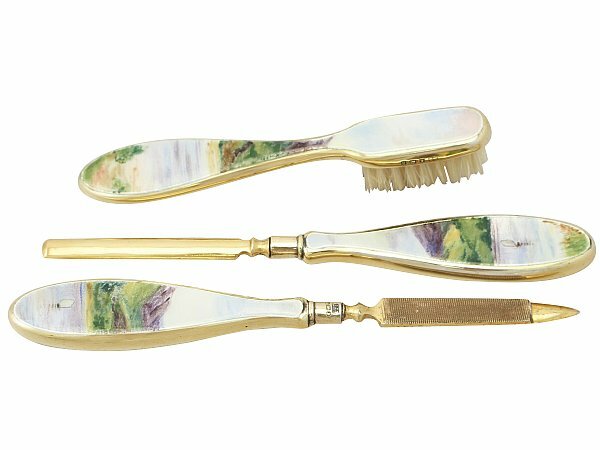 The nail buffer is fitted with a shaped subtly concaved sterling silver handle to the centre of the enamel design. This impressive nail buffer is encircled with a detachable sterling silver gilded frame which secures the replaceable chamois to the underside. This impressive antique enamel dressing table set is fitted to the original leatherette tray with a velvet lined interior. 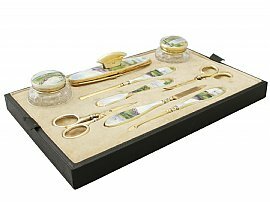 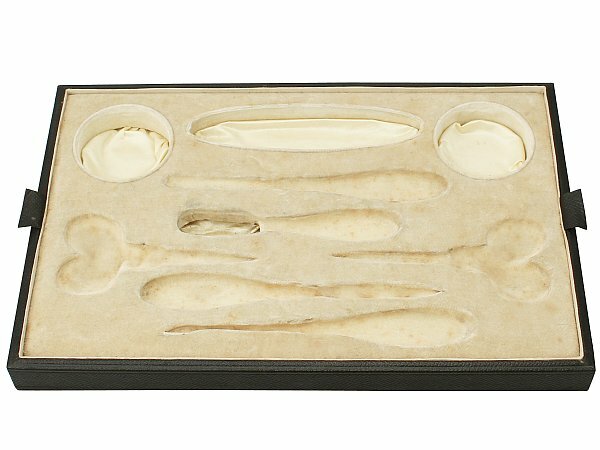 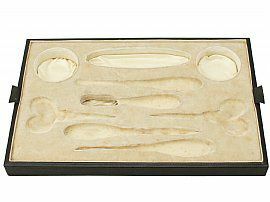 This dressing table set has the same credentials and is crafted in the same style as the tray A3000 and would all sit well together. 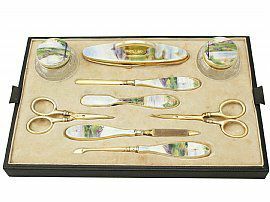 This antique dressing table set is a very good gauge of silver, fine quality and in excellent presentation condition. 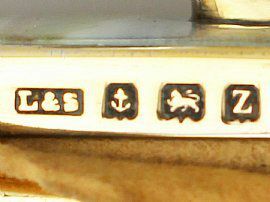 The enamel to each piece is in perfect condition. The gilding shows sign of wear in keeping with age. 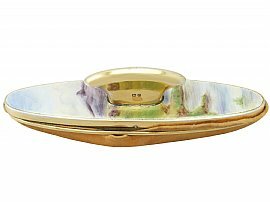 Full hallmarks struck to the surface of each piece show signs of wear in keeping with age. 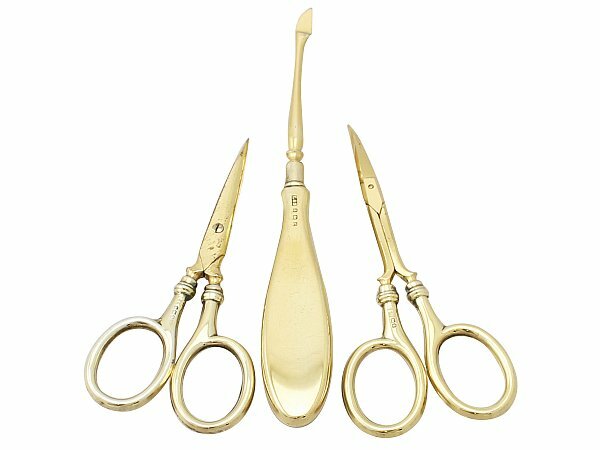 Dressing table jar height 4.6cm/1.8"
Dressing table jar diameter 5.5cm/2.2"
Nail scissors (curved blades) 10.8cm/4.3"